This spooky nail art design is the cat's meow. Book Giveaway: Monster Knits, Crochet Bakemono, and more! Leave a comment and you could win one of three books! Check out the creative results of Spoonflower's latest fabric design challenge. 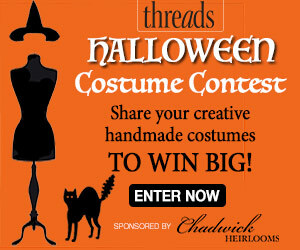 Enter the 2011 Threads Halloween Costume Contest! Share your handmade Halloween costumes in the Threads contest gallery and you could win prizes from Beacon Adhesives and SewingPatterns.com. As we count down the days until Halloween, we continue to celebrate Breast Cancer Awareness Month with our Make it Pink Challenge.